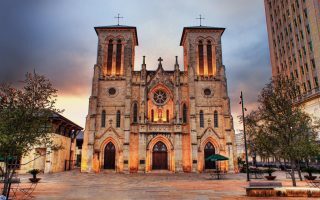 The 7th largest city in the United States (and growing), San Antonio has a rich and storied history, with old and modern landmarks, making it a scenic place to explore by run. Originally settled by Spanish Catholic missionaries in the late 17th century, over time this new Spanish Mexican province became the capital of the Southwestern lands. Over a series of battles over 30 years, starting in 1828, this territory, the capital of which was San Antonio, was taken over by Americans, and finally annexed into the United States in 1845. The Alamo, the location of one of the major battles for Texan independence, is located downtown, as are other historic landmarks including the 17th century missions and the San Fernando Cathedral. 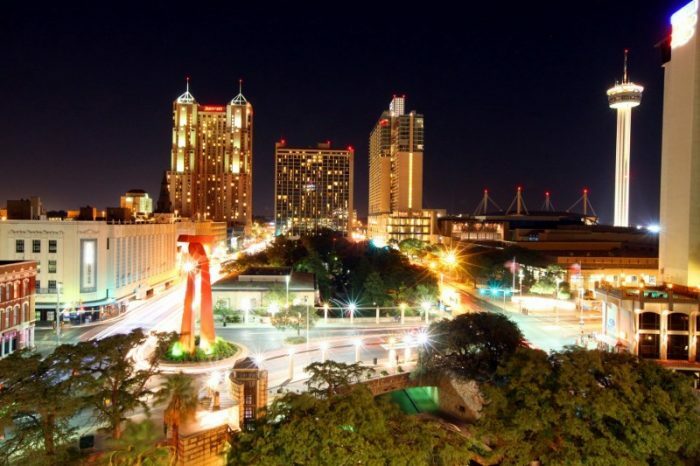 Tourist and cultural attractions include the Tower of the Americas, San Antonio Museum of Art, Blue Star Arts Community, and the River Walk, winding through downtown and beyond along the San Antonio River. This is our guide to the best places to run in San Antonio, Texas. There is very good running accessible from downtown hotels. 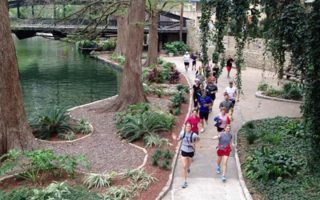 The centerpiece is the River Walk, 2.5 miles downtown, with River paths continuing further south to the historic 17th century missions.The San Antonio Highlights Loop runs by all the major landmarks in the downtown area. 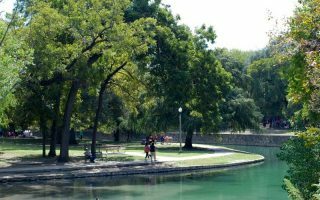 For quieter, less city-congested runs, Brackenridge Park and Olmos Basin Park are close to downtown. The Alamo Heights and Terrell Hills residential neighborhoods are great for running. Further out, just past the airport, are McAllister Park and Eisenhower Park, and opportunities to get a taste of Texas Hill Country running. There is also an extensive and growing network of greenways and linear parks, which are great for running. Transportation wise, there is good running accessible from downtown. There are buses but no real rail or metro system. Anything outside the city requires a car. The airport is only 15–20 minutes away. 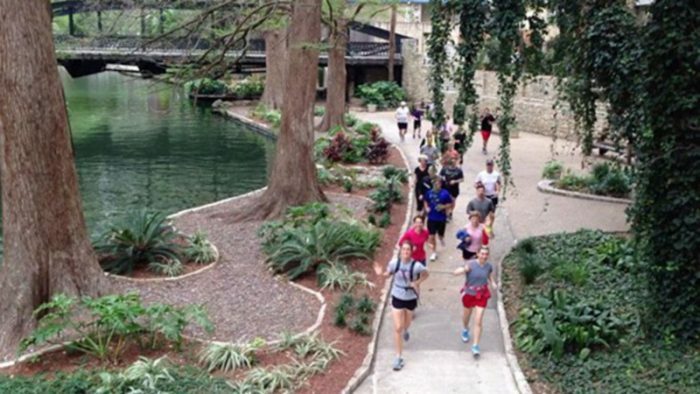 San Antonio’s signature running trail and a top tourist attraction. There are ~15 continuous miles. We provide a map of the entire River Walk, plus a 6 mile round trip route, passing by many of the city’s top attractions. 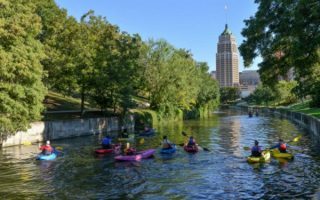 A 5.5-mile tour of San Antonio’s downtown highlights: River Walk, Market Square, the UT San Antonio, Tower of the Americas, Blue Star Arts Complex, & the Alamo. Part of the northern section of the River Walk. Popular, 350 acre park and home to the Japanese Tea Gardens, Botanical Garden, and the San Antonio Zoo. Part of the River Walk or ~3 miles within the park. 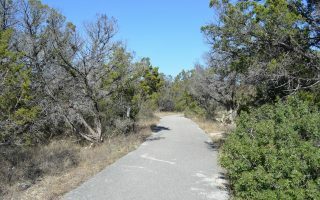 Part of the southern extension of the River Walk, this trail runs by the 18th century missions, including Mission San Juan and San Antonio Missions National Historical Park. 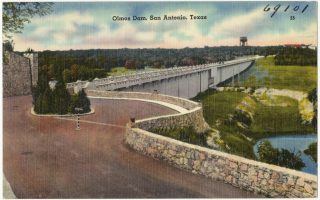 A hilly run topping out at 817 feet, the Olmos Dam allowed for the renovation and restoration of the San Antonio River after the great flood in the early 20th century. 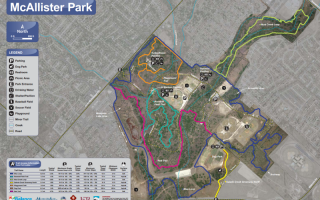 A popular run near San Antonio Airport, McAllister Park features 5 miles of asphalt trailsand 10 miles of unpaved natural bicycle and cross-country trails, including “Blue” and “Red” loops. A taste of Hill country close to downtown, near UT San Antonio. This hilly, neighborhood run starts at the popular Hills and Dale biker bar, next to Aguascalientes Taqueria, which is famous for breakfast tacos (do the run first!). Located just west of the airport, Eisenhower Park has 5 miles of trail runs– but bicycles are not allowed! The weather in San Antonio is fantastic for running, mild to warm, between October and May. 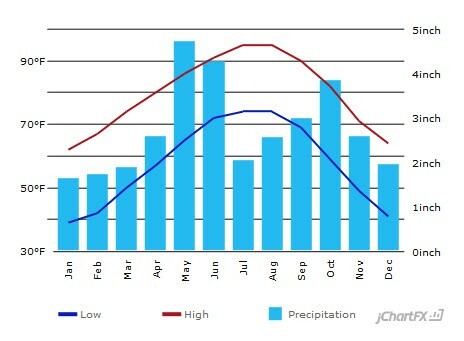 The summer months are hot but not quite as brutal as other Texas cities. Snow and freezing temps are rare. Geographically, the city is fairly flat, but there are hills just beyond the city. Most of the hotels in the city are located in the heart of downtown. Some are located along the River Walk, with a basement entrance to the walk itself, others are only a few blocks from the downtown area itself. With the airport only 10 miles (a 15–20 minute drive) from the downtown area, if you have to stay near the airport, a visit to the downtown sites and a run past the landmarks is still easily achievable. Best bets in the downtown area are San Antonio Running Company and Run Wild Sports. RunWild Sports. Multi-sports boutique store between downtown and Brackenridge Park. 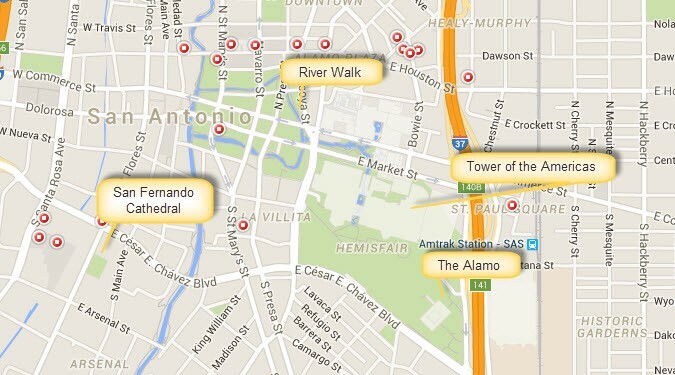 San Antonio Running Company — Located in the heart of Downtown San Antonio. They also promote the Spectrum Trail Race Series and a number of trail and off-road races, including ultramarathons in Colorado and Big Bend Ranch State Park. Fleet Feet San Antonio. In Alamo Heights. Note: moving spring 2016 to the Quarry Mall, just north of Olmos Basin Park. We Run San Antonio — Founded in 2004 as a small running group, We Run has expanded into one of the most successful training programs and stores in the area. Stores located in Alon Park and Leon Springs areas, offers customized training programs and has a specific New Runner Program. Soler’s Sports — Alamo Heights. Specialized for triathletes. Group Runs: Sunday mornings, with up to 80 people of all levels and ages attending, and fun runs on Wednesday evenings of 4–5 miles. 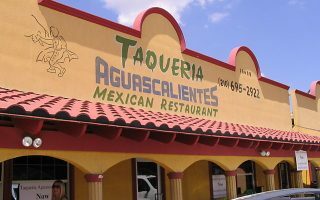 Run On (iRun Texas) — Three locations: Stone Oak, Bitters (near UT San Antonio), Dominion. Lots of training programs and events. San Antonio Road Runners has an active group. Click on ‘where we run’ for additional running route options. Humana Rock ‘n’ Roll Marathon. December. Starts and finishes at the Alamodome, the race winds through the city, passing major landmarks and neighborhoods such as The Alamo, Trinity University, the Blue Star Arts District, Padre Park and Mission San Jose, and the Riverwalk. Also held on the same day are a half marathon, 10K, 5K, Relay, and Kids Rock race. I Ran Marathons Park Series – A series of eight marathons held over the course of eight days in San Antonio in mid February. Participants can choose to run all eight, or a combination of each. Also included are half marathon and 10K options. Alamo 13.1 Half Marathon – March.Begins and ends in front of the historic Alamo, and is started off with a cannon blast. Carnival of Venice Half Marathon – Just before the annual four-night Fiesta Celebration, this half marathon will be held for the first time in 2016. Started in 1891 to honor the battles of the Alamo and San Jacinto, the purpose behind Fiesta San Antonio has changed over the years to now commemorate a celebration of the city itself. A 5K will also be held the same day. Spectrum Trail Racing Series – A series of trail racing events throughout Texas (and some beyond), these races are held throughout the year and vary in length from 10K to 50K.